Stock photo of street signs for Route 85 West and Yellowhead Highway in the City of Winnipeg, Manitoba, Canada. Street signs for Route 85 West and Yellowhead Highway in the City of Winnipeg, Manitoba. 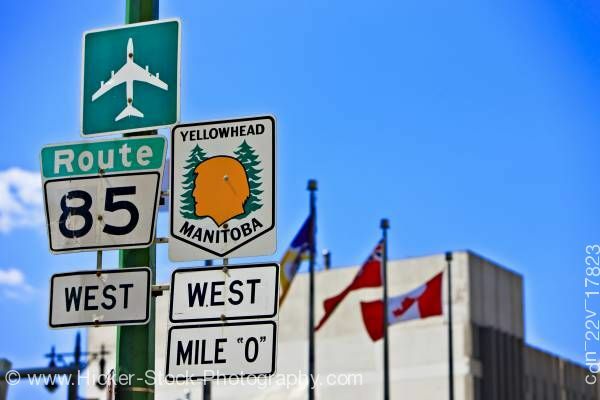 This stock photo shows street signs for Route 85 West and Yellowhead Highway in the City of Winnipeg, Manitoba, Canada. The foreground of the photo shows a green post with several direction signs. Above is green airport sign. Below to the left is the Route 85 sign and to the right of it is the Yellowhead Manitoba sign. This sign has two green trees and a orange silhouette of a man's profile. Below each the Route 85 and Manitoba sign are West signs. Below the west sign to the right is the Mile "0" sign. Behind the signs are three flags, the last in the row is the red and white Canada flag. The background shows the side of a white stone building. Bright blue sky is prominent of the background. A couple of small puffy clouds to the left of the Route 85 sign. Street Signs including Mile 0 of the Yellowhead Highway in the City of Winnipeg, Manitoba, Canada.